The animals have fled in all directions following the panic at the church. Vixen blames herself I just ran and now the poor things are scattered everywhere . Fox wants to go back for the other animals, but Kestrel points out it would be too dangerous. Whistler says that it is down to the birds to find everyone. A tearful Mole begs them to find Badger. 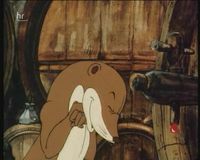 Badger and Weasel are hiding in a pub cellar, where Weasel soon gets drunk on beer leaking from a barrel and ends up singing loudly and crashing through the streets. Hearing Weasel’s noise Owl manages to find them and guide them back, with a drunk Weasel riding on Badger’s back. 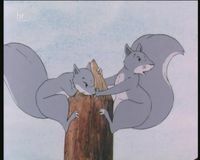 Meanwhile, Kestrel finds the Squirrels sitting nervously up a telegraph pole and they soon arrive, exhausted but safe. Badger and Weasel are the next to arrive, much to Mole’s delight. Adder saves the Mice, Shrews and Voles when they are are almost run over by a lawnmower on a golf course. For a moment it looks as if Adder has sacrificed her own life underneath the lawnmower, until she emerges from a hole unhurt. Eventually everyone is together again, apart from the Rabbits. Toad says that they will soon be on their way, but Weasel is now fast asleep after her adventure. 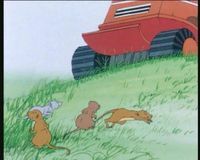 The animals discuss how much the journey has changed all of them, even Adder! Whistler finds the frightened Rabbits stuck in a trench on a building site, but Mr Rabbit is too heavy for him to lift out. Once again it is down to Fox to rescue the Rabbits and finally the animals are together again. Some of the animals are almost sad that the journey is almost over. Old Mother Vole says: As for that oath we made. We will keep it amongst ourselves, and amongst our children’s children so that the spirit of this journey will be kept alive forever . 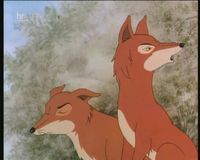 She is applauded by Fox who suggests that as they are altogether they should go and finally finish their epic journey. As sunset aproaches the band of animals reach their final destination, where they are greeted by the White Stag. Toad is the first to enter the park. Badger says that it is all thanks to Fox. Fox says that he just wishes everyone could have made it. But those of you who did have made history, says the Stag. Welcome to White Deer Park.